Soviet era "activists" in the field of folklore and culture. Seated left to right are the kobzar Ehor Movchan, Marfa Kriukova, the Russian performer of lament and epic, the kobzar Kushneryk, and the lirnyk Dodatko. 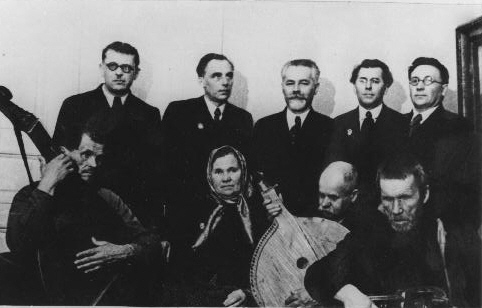 Standing, left to right are: the composer Kozyts'kyi, the writer Petro Panch, Academician Iurii Sokolov, the poet Pavlo Tychyna and the composer Verykivs'kyi. Photo taken 1930.